NMW: So how did you get into Tattoo art, were you into it before you became a tattooist? 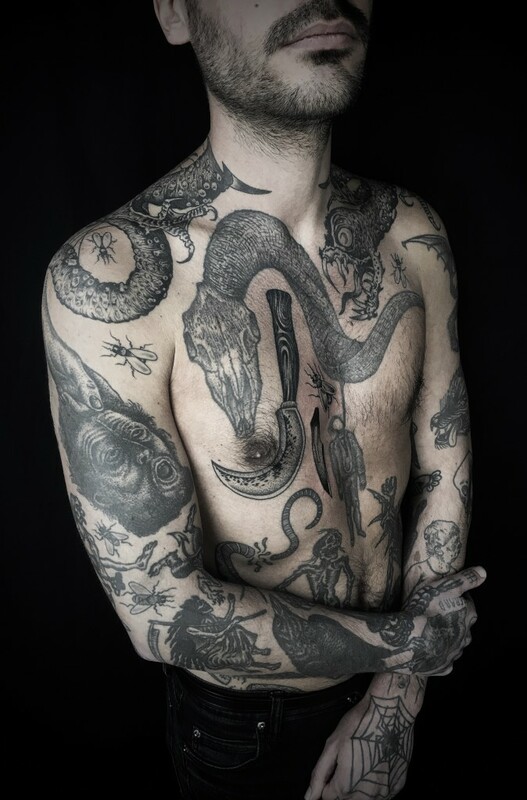 RDL: When I started getting tattooed I got into it really fast, I mean I became friends with my tattooist when I was doing building work, and he told me you should stop this and do more drawings, and come on the weekends here. This was Olivier; he has a shop in Montreal now, called Glamord. NMW: So how long have you been tattooing now? RDL: I started 14 years ago, but I started seriously later, the first 3 or 4 years was like flat and trying to, then I met Guy [Le Tattoer] 10 years ago and he took me to work with him, so it’s been 10 years now every day. 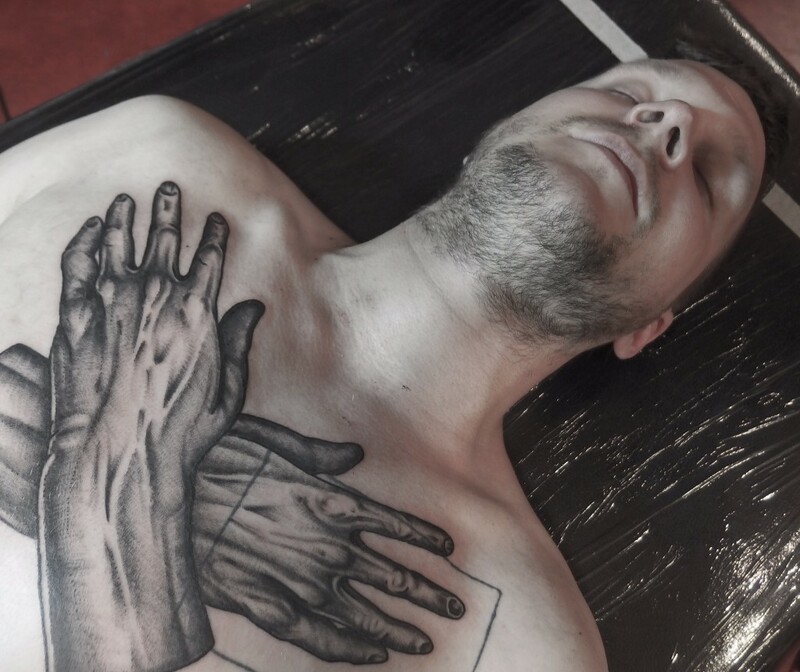 NMW: So you worked with Guy Le Tattooer, where was he working then, was that in his old shop? RDL: Yes it was in a real old shop he had in Toulouse, it was called Alternative Tattoo. That was now 10 years ago, I work for him there for a few years, then we open a shop called La Tannerie, then we closed it. NMW: Being from warmer climates, Can you tell me a bit about how and why you came to London? RDL: I came to London Because I met a woman…. So I decided to stay here, I was working at Shangri La at first, then I met Jondix at some convention and I wanted to change shop as it was a bit slow for me, and then Jondix told me you can work with me at Seven Doors. Obviously I was really really happy, I mean I do black and dots so he was one of the people who influenced what I do. NMW: So how did you come to your style now, have you always kept it completely black? RDL: I did maybe 2 or 3 tattoos with a bit of red, like 12 years ago… I started doing just black when I met Yann Black, I dunno if you know him, he was working at Glamord with Olivier in Montreal. He does a bit of colour, red sometimes, but mostly just black, so I started doing just black after I met him, and I started doing dots, I use a lot of dots. About 11 years ago I did a portrait of Frankenstein on my sister and I did all dots shaded, and so I started doing all dots portraits, that sort of thing. And then with Guy I think we’ve been influencing each other for a few years, I learned a lot from him, like if you do black you should do other things than dots, to make it a bit more interesting. But always black. NMW: Keep it true. So what do you take influence from now days? RDL: Nowadays ,devils and satanic imagery, Spanish paintings with creepy devils with faces, and I think when I do portraits its influenced by that, and I’m really influenced by movies and music, mainly metal and those aesthetics. NMW: What movies are you into? RDL: Dark stuff, I really like old Georges Franju, French movies from the 50’s 60s, he did the eyes without face, all black and white, really dark subjects, like Film Noir, that kind of things. 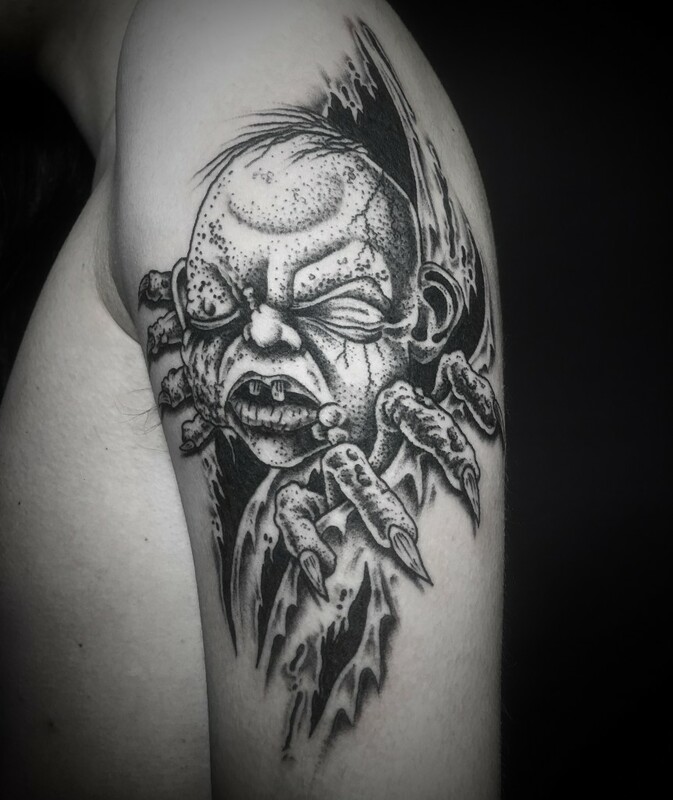 When people ask me for Horror movie tattoos I’m really happy, for the work it’s a good influence. NMW: First for you at Brighton this year… That’s exciting! Have you worked any other Conventions in the UK? RDL:I never worked in Brighton, it’s going to be the first time, I go to Brighton a lot, but never work there, I try to go as much as possible with my girlfriend and my dog, but I’ve never been to the convention before. In the UK never, I do Paris and I think I don’t do that many convention, I would like to do more, I just started doing conventions recently. NMW: How do you find working in that environment? 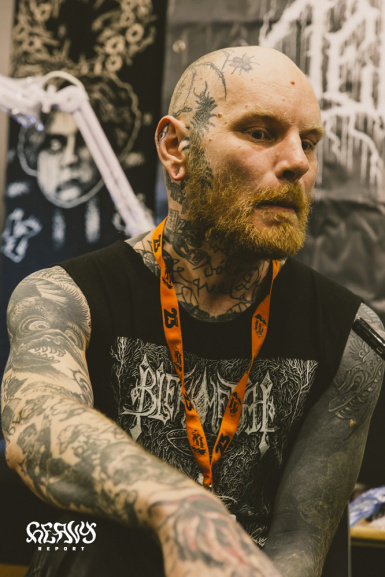 RDL: Now I think I’m ok because I have a few years of tattooing, I think I did a few like 7 years ago and I didn’t feel comfortable at all, but I’m more sure about my work now, so it easier to set up if you have customers, you just have to focus on the tattoo. Conventions are nice, you always meet good people, I think it’s going to be good. NMW: Are you going to have any prints or anything to sell? RDL: I’m gonna have some, patches and stuff, I just did some prints recently horror movie based and I’m going to bring that, and I’m going to do t-shirts, loads of stuff. NMW: What are you plans, I know you say you want to do more conventions, is there anything you do outside of tattooing, any creative endeavours? RDL: I’m trying to organise my time now, I want to do way more illustrations, started working slowly on a series of back pieces illustrations, I’d like to do 6 back piece illustrations, and that takes time. Full body suits. NMW: Like the Body Scrolls Exhibition that will be at the Convention? Did you do any in that? RDL: Yes I did two, I did a guy and a girl, I was really happy, was nice to have a deadline, you know when you have an exhibition like this you have a deadline. I’m quite proud of the work I did for the back pieces; I’m really happy with it. NMW: How long did it take you? RDL: It took me about 7 or 8 nights on each one – I’m slow, I take my time. I just finished one painting from an exhibition in Rome and I’m working on another one for an exhibition in Paris now. NMW: What kind of paint do you work with? RDL: When I do bigger stuff I use a brush, a really thin brush, and I do everything with liquid acrylic. I did like that for the body suit scrolls, same technique. When I draw or paint I use dark shading, when I tattoo I use other methods. NMW: Do you like to do big work like that? RDL: Yes, as a creative person, for me I think of it a bit like a child wanting to show how nice his drawing is, for me it’s the same with the body suits, you know I have the good feedback from people I respect. Bigger stuff is always more impressive. Recently I have had some back pieces and full fronts, not yet body suits, I mean I have one person who I’m basically doing a bodysuit on. To find somebody who has nothing is difficult. I like it though, I’m impressed by the full body suits, but I prefer for me, to have smaller bits really. See more of Raf’s work on his Instagram here – If you want to get tattooed by Rafel Delalande during the Brighton Tattoo Convention email him rafeldelalande@gmail.com. Drop by his booth to check out his flash, prints and more. Raf will be accepting some walk ups so try your luck if don’t manage to get a pre-booked space. The Brighton Tattoo Convention takes place April 30th to May 1st at the Brighton Centre. Click here for a full list of artists. Still haven’t got your tickets? Book now.